With Valentine's Day coming up next week, it seemed like a good time to run a RANCH ROMANCES cover . . . because nothing says romance like a gun battle. I don't like RANCH ROMANCES from the Thirties as well as I do the issues from the Forties and Fifties, but it still had some good covers and fine authors writing for it. 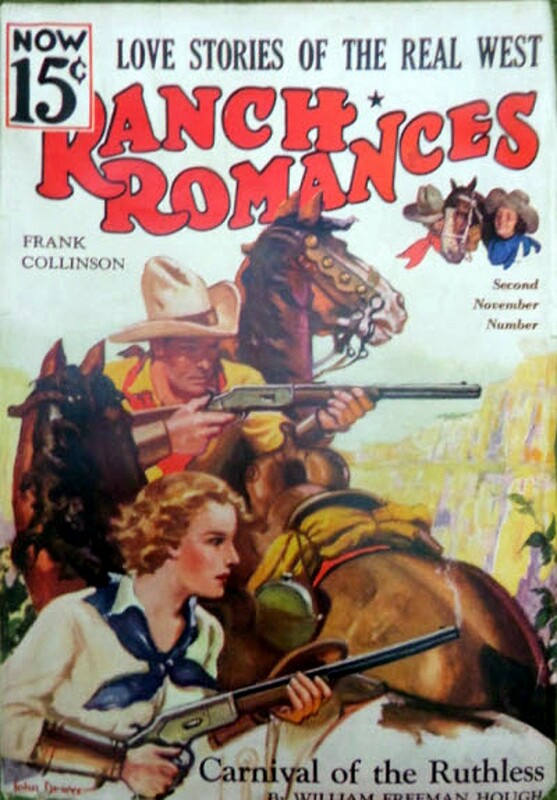 In this issue, there are stories by Stephen Payne, William Freeman Hough, Clee Woods, Cliff Walters, and Elsa Barker, all regulars in RANCH ROMANCES. Couples that fight together, stay together. Those that battle together, herd cattle together.